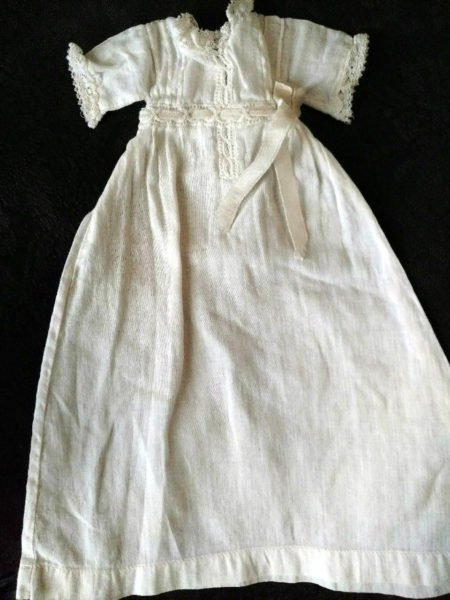 For a tiny infant baby doll, a sweet long cotton doll dress in white batiste fabric. Dress dates from the early 1900’s to 1920’s. It is a home sewn dress on a treadle machine. Bodice is made with three rows of vertical tucks on either side of the center front and back. Lace trims the neck line, edges of the sleeves. Dress is made with a high waist with a lace insertion. A ribbon is run through this insertion, which ties in a bow to the one side.